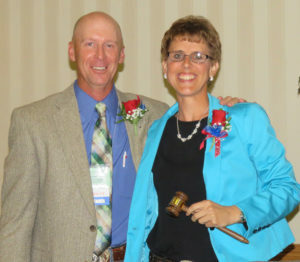 North Platte, Nebraska) Regina Andrijeski, Old West Realty & Auction, Curtis, has been elected President of the 250-member Nebraska Auctioneers Association for 2016-2017. Old West Realty & Auction prides themselves in offering their clients the best in today’s real estate and auction technology like computerized clerking, live internet bidding, multi-parcel auctions, online only auctions, outstanding web exposure and social media. 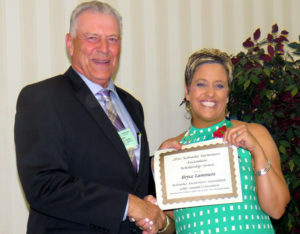 Her election was announced at the 68th Annual Convention of the Association held at the Sandhills Convention Center, North Platte, Nebraska, May 27-29, 2016. Miles Marshall, Marshall Land Brokers & Auctioneers, Kearney, was elected President-Elect and Mark Beacom, Auction Solutions, Omaha, was elected Vice President. Russ Puchalla, Heartland Auction Co., Roca, Nebraska, was elected Secretary/Treasurer. Newly elected Board Members include Dean Dallmann, Kort-Dallmann Auctions, Franklin; Roy Montgomery, Montgomery Auction & Realty, Guide Rock; and Scott Jarman, The Auction Mill, Cedar Bluffs, Nebraska. The annual NEAA Championship Auctioneer and Ringman Contest was held on Friday, May 27, 2016 kicking off the first evening of the 68th Annual Convention. Twenty contestants competed for the honor of 2016 Nebraska Champion. Adam Marshall, Adam Marshall Auctioneers, Elm Creek, Nebraska, was named Nebraska Auctioneer Champion for 2016 and Logan Peters of Pender, Nebraska, captured the 2016 Nebraska Ringman Champion title. Adam Marshall received a commemorative plaque, trophy belt buckle and $500 cash prize. Marshall was also awarded the entry fee to the 2017 International Auctioneers Championship and will represent Nebraska in the competition. Logan Peters received the Jon Moravec Memorial Ringman trophy. The top ten consisted of Dan Helberg, Helberg & Nuss Auctions & Realty, Gering; Russ Puchalla, Heartland Auction Co., Roca; Kam Hartstack, Hartstack Auction Group, Clarinda, Iowa; Shayne Fili, Auction Solutions, Omaha; Mark Kliewer, Kliewer Auction Service, Kearney; Scott Jarman, The Auction Mill, Cedar Bluffs; Rookie of the Year, Austin Creamer, Creamer Heimes Janssen Auctioneers, Hartington; Runner-Up, Courtney Mensik, Jack Nitz & Associates, Cedar Bluffs; Reserve Champion, Curtis Wetovick, C W Auctions, Fullerton. 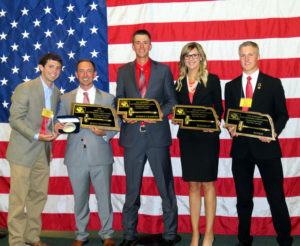 Rookie of the Year, Runner-Up and Reserve Champions all received commemorative plaques. 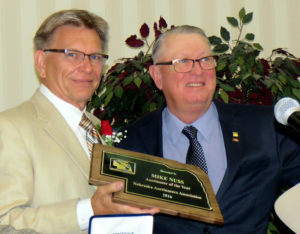 Also in conjunction with the Convention, Mike Nuss, Helberg & Nuss Auctions & Realty, Gering, Nebraska, was named Nebraska Auctioneer of the Year. Mike was awarded a commemorative plaque, Stetson hat and trophy belt buckle. 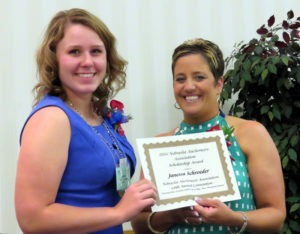 Awarded $1,000 college scholarships at the annual awards banquet from both the Association and the Auxiliary were Bryce Lammers, Fordyce, son of Lyle and Rhonda Lammers and Roger Janssen’s grandson, Creamer Heimes Janssen LLC, Crofton; Janessa Schroeder, daughter of Troy and Leslie Schroeder and granddaughter of Randall and Barb Ruhter, Ruhter Auction & Realty Inc., Hastings; and Kathryn Scanlon, daughter of Mike and Arlis Scanlan and granddaughter of Marvin Caspers, Marvin Caspers Real Estate & Auctions, Auburn.